Fittingly, as the Sony Ericsson Open turns twenty-five this year, the first week of competition has already provided tons of fireworks on the courts. Here are just a few of the most memorable occurrences. The initial two days were taken up by the qualifying rounds. Despite receiving wildcard entries, former major champions Swede Thomas Johansson and Argentine Gaston Gaudio did not move on to the main draw. In addition, the Americans teenager Donald Young and veteran Vincent Spadea failed to advance. On the other hand, Taylor Dent, whose career has had fits and starts due to niggling injuries, progressed into the primary field along with Michael Russell, Amer Delic and thirty-something Jill Craybas. As the action got underway for real on Thursday, Dent’s hot hand continued. The American beat two top twenty players in the second and third rounds, Spaniards Nicolas Almagro and Tommy Robredo respectively. In the round of 16, Dent will face Roger Federer; this will be their first encounter. Albeit the world number two has had multiple kinks in his game, Dent will need to pull off the performance of a lifetime in order to vanquish Federer. Surprisingly, the 14th seed Argentine David Nalbandian made a second round exit while James Blake, the 13th seed, was halted in the third round by Czech Thomas Berdych. The sole top ten male to scent any whiff of difficulties in the third round was Frenchman Gael Monfils. The 9th seed clawed back from a double break deficit and saved two match points against Marat Safin, the 22nd seed and former major champion, before prevailing in a third set tiebreaker. 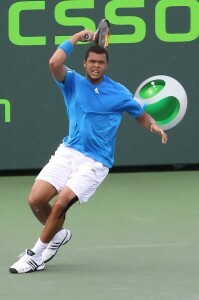 Top seed Rafael Nadal, Federer, Novak Djokovic, Andy Murray, Andy Roddick, Juan Martin Del Potro, Gilles Simon, Fernando Verdasco and Jo- Wilfried Tsonga are also into the second week. Much of the ruckus appeared to be on the women’s side. The rain was not the only nuisance at Crandon Park on Sunday as a ragging storm decimated through the elite ten. Actually, the turbulence commenced Saturday evening with the last match of the day featuring world number three, Serb Jelena Jankovic. The usually steady Serb was ushered out by Argentine Gisela Dulko. Jankovic’s game has been stagnating; for the second consecutive tournament, she has made a second round exit. After the euphoria of the previous night and the quick turnaround, Dulko lost the next afternoon in straight sets to Czech Iveta Besenova. Another Serb Ana Ivanovic, the world number 7, was also excused in the third round by gifted Hungarian youngster Agnes Szavay in three sets.